Have your recently joined the Work-from-home Army? According to Global Workplace Analytics and the Telework Research Network about 20 million to 30 million Americans work from home at least once a week. Are you lucky enough to work for a company that allows this, or have you decided to become a freelancer? If the answers are yes, then you need to create a productive work space within your home. To started, make sure you have the right tools! Below you’ll find a list of some of the home necessities that you will need to create a productive work space. According to OSHA, It’s really important you have a chair that conforms to your body – it’s better for health and comfort. If you have to keep shifting yourself to get comfy, it means your chair could potentially be causing health problems. A swivel chair is a smart choice too – you’ll be able to move swiftly between different areas in your room. If you’re on the shorter side, you’ll find a chair with a low or medium back will provide adequate support. For those who are taller, a chair with a higher back will suit you. Your desk will contain the things you use most, so it’s a good idea to have one that allows you to arrange your needed items in a way that makes them easier to find and use. Desks usually come in three styles – a straight desk with drawers, a corner desk with drawers, or a desk with both drawers and a hutch. To get an idea of the available sizes, shapes and designs, browse through the products of an established furniture retailer such as Super A-Mart. Often, drawers attached to the desk simply aren’t enough. It’s highly probable you’ll need filing cabinets, or bookcases. They’re available in a range of sizes to suit your needs and budgets, and they’re quite stylish these days too – no more drab greys and beiges! Another great way to make the most of your space is to purchase multi-functional furniture with hidden storage compartments. Natural light is always the best choice in the daytime. If you have windows (not everyone does! ), allow plenty of natural light in during the daytime. If there’s a lot of sun exposure, you’ll need a filter of some sort, so as not to place too much stress on your eyes and cause your furniture and carpet to fade. At night, don’t use a light that’s too dim, or one that’s too bright – they’re equally damaging to the eyes. Go for lights with a medium colour temperature and that spread light out over a wide area. Working from home should bring you satisfaction and not feel like an unpleasant task. Your work space should be quiet, full of all the necessities and it should make you feel productive. Without the essentials, you will be sorely disadvantaged, limiting your creative abilities and causing plenty of time-wasting distractions for yourself. 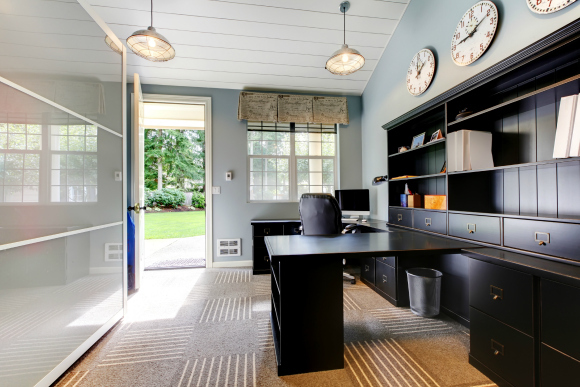 Have you recently created your own work space in your home? What do you think is vital? Share your thoughts and answers below in the comments section.